Interview with Barbara English; The Woman Behind The Next Cool Event- May 4! 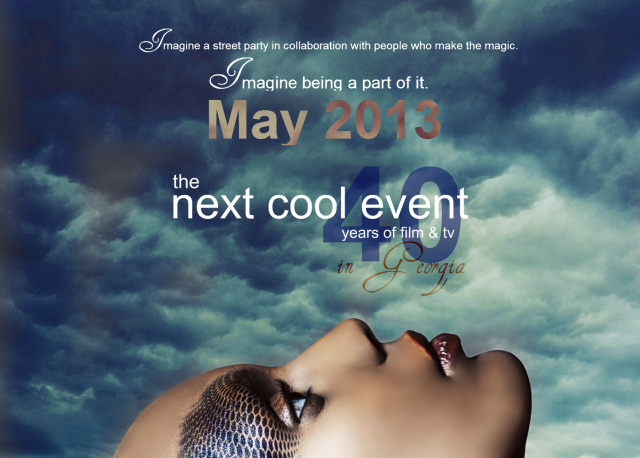 Try to imagine a collaboration of film professionals, amazing interior design, fabulous food and the top creative people in Georgia all under one roof and you will begin to understand The Next Cool Event coming to the Le Fais do do, May 4, 2013. Film set designers, interior designers, event designers, locations, wardrobe specialists and others who are in the business of creating magic come together to show off their skills creating art installations or sets inspired by a film or television series. Catering companies get into the act with a vast array of samples throughout the venue. There is no event like it in the world. We caught up with the woman behind the event, Barbara English. Here’s what she had to say! For those who aren’t familiar with the The Next Cool Event, can you tell us what it’s all about? The event was born out of the need to promote the creatives in the state to the burgeoning film industry growing with the tax incentives that were passed in 2008. The film industry decision makers largely come out of California and upon arrival in Georgia they were unaware of all the resources that we already had in place here. Many craftspeople, designers and artisans were suffering from the economy and the downturn in the housing market here, as everywhere else, and the film/TV production market was a new market for many utilizing the same skills and supplies. Since that time, the two day event has become a celebration of everyone in all of the creative industries such as interior design, event design, and graphic arts, as well as the other types of entities who benefit from the coming together of all these professionals under one roof. The main mission is to bond these industries and make all of them more familiar with each other to facilitate doing business together. Most of the people involved are independent contractors and limited ways of reaching each other. Each of them know some, but not all. Doing this event year after year allows them to show and tell about who they are. We create a magic event that everyone wants to attend. Most real decision makers do not have the time or inclination to go to networking events or meetings. They are too busy working, but they will show up at one Must Attend event a year. The real business gets done as people get to know each other through the process, during the event and beyond. This year marks a special one for The Next Cool Event. Can you tell us why this year is special? This is the anniversary of the establishment of the Georgia Film Commission by Jimmy Carter in 1973. At the time the film industry came into Georgia and the state experienced its first boom in film production. Now that we are back at it again, we wanted to honor all the new people here as well as give thanks and celebrate all the people who were there from the beginning. What can attendees expect to get out of this event? If attendees are in one of the creative professions, their opportunity is to become more involved in their profession by meeting influencers and competitors and hopefully develop a better understanding of the massive amount of opportunity in Georgia now. If attendees are not part of this world, this is a glamorous peek into a magic creative world. Our exhibitors must represent who they are and what they do, inspired by a film or television show. They create art installations to show how creative and skilled they are. With friendly competition, they try to outdo each other and the end result is an event not like any other in the world. There are also great catering companies who show off a wide variety of different types of cuisine throughout the event and there is an open bar, music and a magic experience to be had. Many people are calling it the Event of the Year and a must attend. Will there be food and drink served at the event? Yes, there is an open bar this year with full service of beer, wine and mixed alcohol. We also have over a dozen catering companies and restaurants involved. Everything is free once you have your ticket and you are in the door. The state of Georgia has become a hot spot for filming, what kind of impact has that had on The Next Cool Event? The tax incentives are how the event got started. Since that time it has become the only event where there is an opportunity for everyone in that industry to get together. The event, however, goes beyond just the film industry. Many of the exhibitors and guests are as much interested in the interior design industry and the event industry. The skill sets serve all three industries, not just film and TV. Where can people find more information on the event? Visit the Next Cool Event’s website and be on the lookout for new stories in the media, on Facebook, LinkedIn and other social media. We know you want to attend! Grab your tickets now!